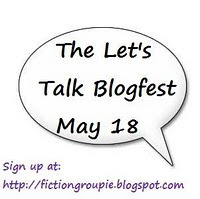 Roni from FICTION GROUPIE put together a dialogue blogfest today. Which means picking a scene of dialogue to share. If you want to participate, head on over there and sign up. I've learned lots of dos and don't with dialogue over the past two years. And I could probably stand to learn even more. *For one, use dialogue tags (he said, she said) only when neccessay to identify someone in the scene. *And, only use other dialogue tags like: shouted, cried, sobbed, sparingly. I used whispered in my scene below because they are in a classroom. But I probably didn't need to. *What else should you use sparingly? Adverbs to descibe the dialogue. For example: "Get out!" John said loudly. Delete loudly. The dialogue should stand on it's own. Use stronger dialogue if you need the reader to understand the emotion. So, here's a scene from my paranormal YA, HANDS TOUCH. 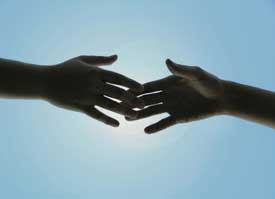 It's between my protagonist, Callen and his best friend, Aaron. Callen is able to see a person's death by touching them. He just had a second vision about a female classmate. This time, he saw how she died AND who was involved. Aaron chuckled nervously. It was a bad attempt at humor. “Same thing.” Callen casually put his hand around his throat because he didn’t want to say the word choke aloud for anyone to overhear. Callen's eyes looked sunken in from the ordeal. He squeezed them shut and sighed deeply. Aaron swallowed loudly, asking nothing further for the moment. And Callen certainly wasn’t sharing it. Callen took a deep breath. Keeping his hand low, he pointed his finger up the aisle. “Figure it out,” Callen whispered. Aaron’s gaze searched the small room methodically until it finally landed on the right person. Awareness darkened his expression now. ** When I isolate a scene like this, I always find a ton of improvements I can make. Anyone else find that? I know what you mean about isolating scenes and making changes. I think as writers, we will always have changes to make. I really dig your scene here. I like the boy perspective, their back and forth converation, and I am dying to know who it is they are referring to at the end! Nice job! yea, everything is different in context. On the other hand, this is quite a good way to find little glitches one might otherwise miss. I like this scene, and the back and forth between Aaron and Callen. Great dialogue! Aaron chuckled nervously. It was a bad attempt at humor. Callen looked grim." The 'Aaron chuckled nervously' could come right after the dialogue as 'he chuckled nervousl'. Do you see what I mean? If not, just ignore me, please. Tessa-- yep. I find I do that a lot (too much). Thanks for the advice! I totally know what you mean about finding things to change! I find myself constantly revising things I want to post, over and over. It's like "writing OCD." Nice scene, by the way. Now I'm wondering who the culprit is. Oh Christina, I really like the concept here. It sounds like a mystery YA. I know you're calling it a paranormal. Is it both? What are you calling it when you query (I am assuming you're querying)? I am going to guess you are getting lots of agent/editor interest in this. I went under your writing tab and read what I think is the beginning of this. I would read the whole thing in a heartbeat! I love this - the tension is great! And even though I don't know anything about the book, I'm dying to know who he's pointing at! Very well done! Yes, I have noticed that particularly in these blogfests that I find improvements when I'm going to post just a bit of a scene. I suppose I should pick all of them apart this way. Harmony- thanks! I do say it has elements of mystery in it, in my query letter. And so far so good as far as interest goes. But I've just gotten started with the querying process. So we'll see! Interesting exercise! I never realized all the work that goes into writing one scene, let alone an entire book! I'm always excited to read your stuff and learn about the process! Great job! I know what you mean about isolating the scene. I found SO many tiny little things to strengthen mine for this blogfest. Anyway, interesting dialogue. What a distressing power to have for a kid. You really made me feel sympathetic for Callen. Cool scene! I have so many questions, so many reasons to read on. You captured the tension of the moment, too. It kept the pace deliciously high, even though the two speakers were talking in hushed tones. Well done! And yes, working with micro-scenes definitely helps me isolate and fix problems I tend not to notice otherwise. I like the process of revelation, though you're right, there are always small things to correct. I suspect we'll only run out of things to correct when we have a blank piece of paper once more. I think perhaps you don't need to spell out their feelings, for example, given that what is said and done already sort of implies it. Still, I like it. I love your excerpt. Good tension and I like the characters. You are definitely right about isolating a scene--I love how it makes the good and the bad pop out in sharper contrast! I thought this was great! You write nicely -- it's easy to tell who's speaking without overusing tags. Well done! I definitely find stuff I'd change in all my blogfest entries. But I think most everybody does. I know exactly what you mean about isolating scenes and polishing them. I've actually been thinking I need to do that with all dialogue. Urgh, will this ever end? Dialogue is tricky isn't it? I often go back and open up my fav books to see how each writers handle it. I can always use more practice. Great scene! I love the characters. Wish I could read a bit more even. The info about tagging is useful. I agree that working on small sections like this makes me see the errors like sore thumbs in my own writing. awww come on this was too short! great scene! very interesting plot idea too. And you are so right, when you isolate a part of your writing for something in particular, I think you do notice more to tweak about it. good point. Wow, that's quite a premise and scene. Good tension and fast-pace. I'd read on, for sure. I totally find things to improve on when I'm looking at an isolated scene! No question. This one was really interesting! I really want to know who the killer is, now! The dialogue was great-- I especially loved the gestures he makes to keep from having to say the words. This really hooked me--I wanna read the novel! I am sooo hooked. I need to know the who! Yep, when I post a snip somewhere I immediately see all the mistakes I missed after the, oh, 40th or so read-through. Grr.